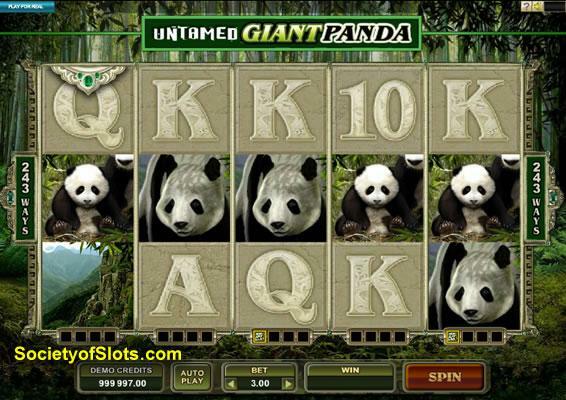 Untamed Giant Panda is part of the new Untamed series from the Microgaming software providers. This game offers you 5 reels and 243 lines of socially responsible action. The purpose of this series is to bring social awareness to some species that are in danger. It delivers you some excellent features to help you along the way, plus a few of those are new for this series alone. 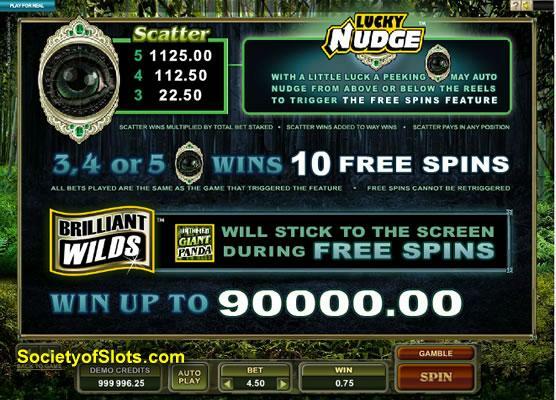 You will find free spins, lucky nudge, trailing wilds, collect a wild and the newly updated your gamble feature. adorable Panda bear. You will find symbols that include the panda, panda bear cub, mountains and the standard K, Q, J, A and 10. There is also the eye symbol which is your ticket to the free spins. When you land 3x anywhere on any of the paylines you will trigger the free spin feature. The wild symbol will match all winning combination but also will go toward another feature offered in the game called the collect a wild feature. Once you have collected four wilds under any one reel it will turn wild for the next four spins. The cool part to this feature is you can trigger multiple reel wilds at the same time and see some incredible wins coming your way, especially with the 243 paylines that this video slot offers. One of the nice parts of Untamed Giant Panda is the quality of the graphics and sounds. Microgaming has done a great job with this release to give you the sense of the world the pandas live in. You will also come across some strong animations within this slot game when you turn the reels wild or get the free spins. All of these features help to complete the overall them of this cute and cudly slot machine. The big money starts with the free spins. The addition of the new brilliant wild feature that is built into the free spin feature can pack a punch. Whenever you land a wild symbol in any position during the free spins that position will remain wild for the duration of your free spins. This gives you the potential to have all 5x reels with multiple wild positions and some serious wins coming your way. The free spins cannot be re-triggered but that by no means takes away from the value it offers you. Your Gamble Feature - The new Your Gamble feature is another new release that Microgaming is offering in some of its new games. This one allows you to gamble all of your winnings or just a part of them, you may bank some winnings or continue to gamble them, up to a staggering 20x. It is pretty easy to see how this has the potential for fattening your pockets. Lucky Nudge - One last feature worthy of mention is the Lucky Nudge. In this feature whenever 2x or more of the eye symbols land on any of the 5 reels and another eye symbol is peeking above or below the paylines the lucky nudge feature can nudge the eye down or up to award the free spins feature. Microgaming has done a great job with Untamed Giant Panda. It offers you tons of winning opportunities with it's 243 lines, not to mention bringing awareness to some of the best animals the world has ever seen.